So today we’re heading over Ou Kaapse Weg to the beautiful little seaside town of Noordhoek not far from the centre of Cape Town. Known for its laid-back attitude and beautiful beach it’s also home to a couple of excellent restaurants. 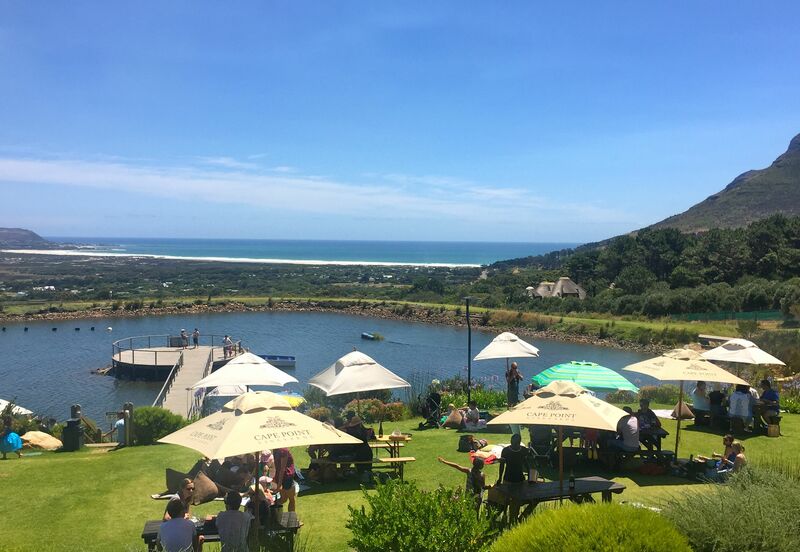 The restaurant at Cape Point Vineyards (CPV) is a fairly recent addition and there’s also the picnic grounds all with fabulous mountain and sparkling sea views. On a shiny Cape Town day it’s a wonderful venue with the deck laid out with tables looking out towards the Atlantic. 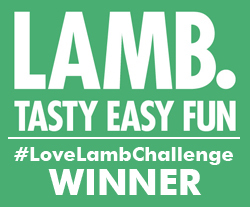 The menu boasts an emphasis on local ingredients like tuna, calamari, kingklip, biltong, springbok and ostrich. The tuna starter was amazing. 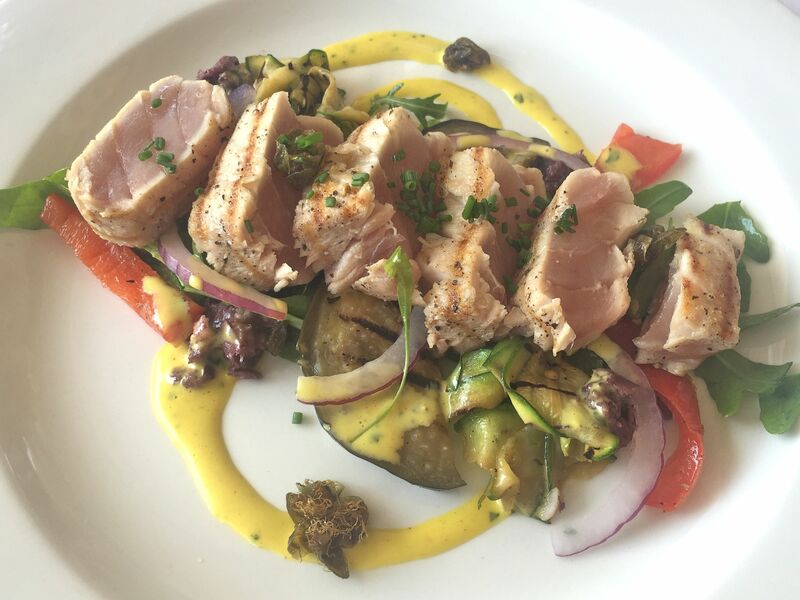 Fresh, just seared and very pink (hate tuna that’s overcooked) it was served on a bed of the tastiest of grilled vegetables, with red onion and garden leaves and the clever addition of savoury olive tapenade and crispy capers. The garlic and lemon aioli dressing pulled all the flavours together perfectly. The starter selection was so good that I had to have two (one as main not as well as a main, that would be a little excessive). 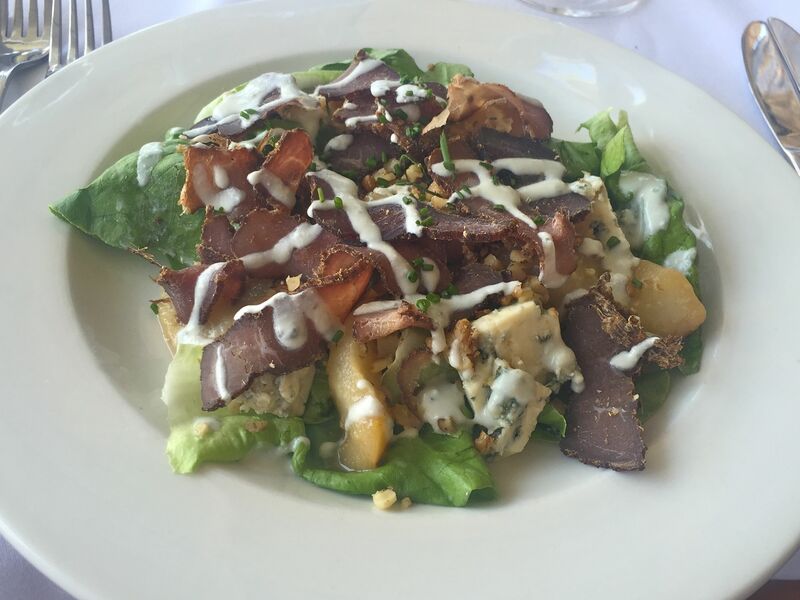 This biltong salad was made up of sweet caramelised pears, blue cheese, shaved beef biltong, tasted walnuts, butter lettuce and a blue cheese dressing. The sweetness of the pears, saltiness of the cheese and dressing and meatiness of the biltong make a combination to remember. I’ll be recreating this at home…soon. 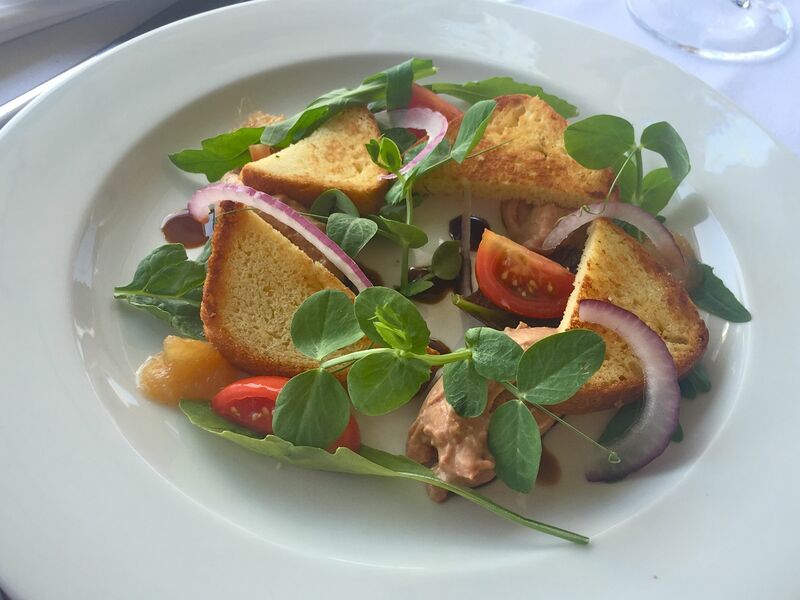 The day’s special starter was chicken liver parfait. Rich, creamy and melt-in-the-mouth. 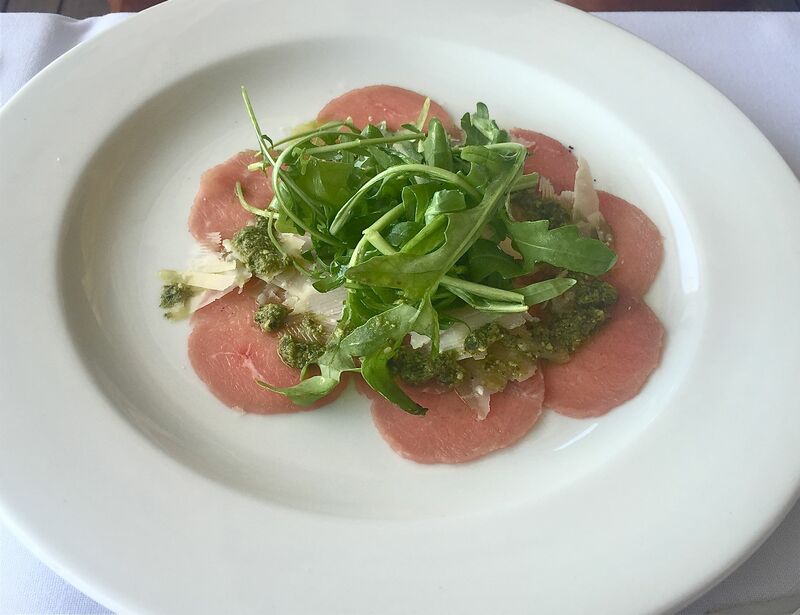 The beef carpaccio came with wild rocket, shaved Parmesan and a rocket pesto mayonnaise. A lovely light summer dish that could have been a larger portion, or maybe we wanted more just because it tasted to so good! On to the mains. 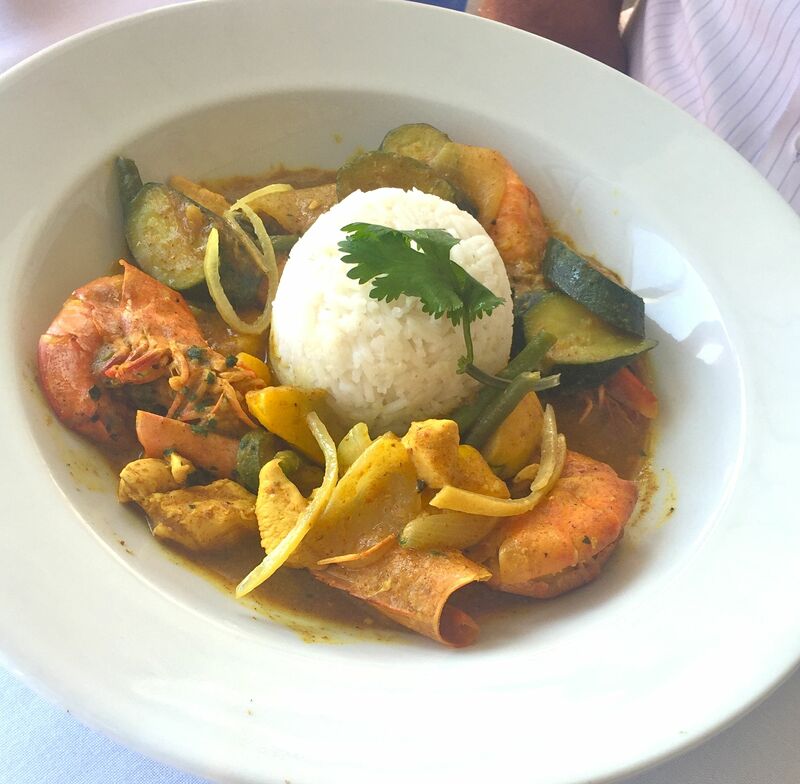 Mixing chicken and prawns in a curry is typically South African and this dish served with fragrant rice, preserved lemon and cucumber mint raita was nicely spicy and light with sweet, juicy prawns. In a nation of carnivores there’s always a steak dish on the menu. One that’s frequently ordered, too. Today it was grilled beef fillet with truffled mushroom sauce, fries and a garden salad. Deliciously cooked medium rare with a light and tasty sauce. I love the setting at CPV and the food’s really good, too. We did go in the middle of the silly season, just after Christmas and service was a little patchy – the place was heaving. As it happened, that made no difference as it gave us the excuse to linger longer over lunch, absorbing the peace and the views surrounding us. You can also picnic at CPV and the baskets sound tasty – you need to order at least 24 hours in advance. And there’s a market day on Thursdays from 4.30 to 8.30pm with market stalls offering the produce of the Cape. Simply bag your space and choose from the array of foodie delights. What a great way to spend a Thursday evening. There’s no doubt this is the perfect place to watch the sun set with a glass of wine in hand. The CPV Sauvignon Blanc is particularly lovely. Anyone for a Thursday evening picnic?